DROUGHT has bitten another huge chunk out of Australia’s beef production capacity, with the national cattle herd this year expected to sink to a size not seen since the mid-1990s. Meat & Livestock Australia’s 2019 cattle industry projections released today anticipates that the national beef herd will decrease to 26.2 million head by mid-year – a further 3.8 percent decline on what was already a declining number due to drought. Just five years ago in 2014, the national herd hit an estimated 29.1 million head, after consecutive above-average seasonal years. Cattle slaughter, beef production and beef exports this year will all bear the effects of the drought burden, as ongoing dry conditions persist across many key cattle production areas. Cattle slaughter is forecast to drop 3pc to 7.6 million head in 2019, based on the continued reduction in the size of the breeding herd and potential pool of available finished cattle. 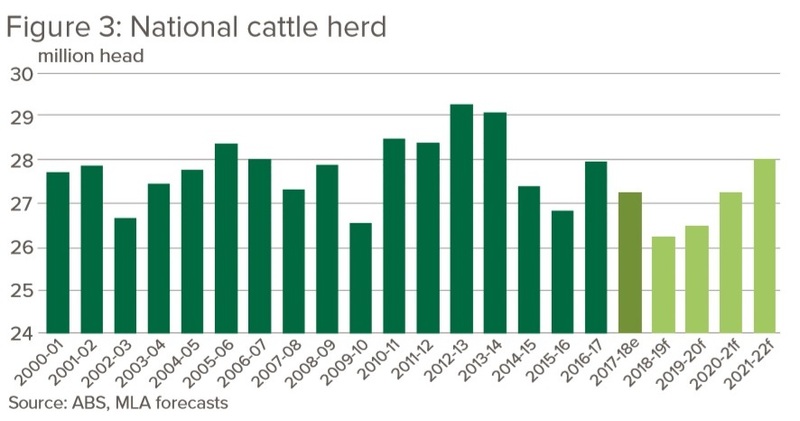 The lingering effects of herd decline and lower calving will echo on into 2020, MLA says, with an even lower annual slaughter of 7.35 million head predicted that year, before a slow recovery. 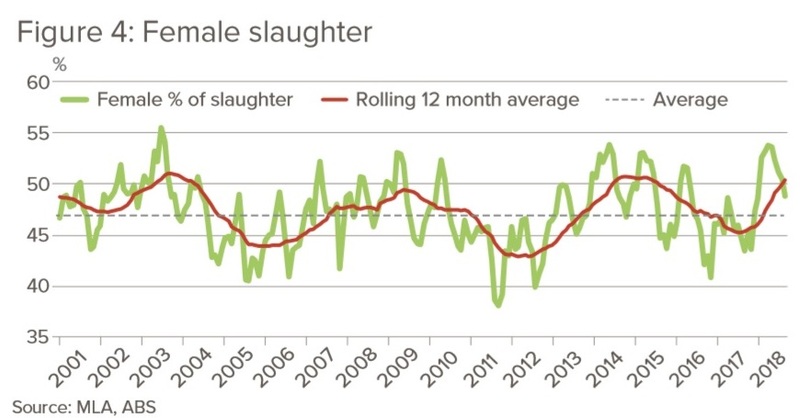 In line with the forecast decrease in slaughter, total beef production is projected to decline 4pc, to 2.2 million tonnes carcase weight in 2019, followed by 2.18mt the following year. The 2019 industry forecast is based on the assumption that below average season conditions will continue for the first four months of 2019 for Australia’s key cattle producing regions, before returning to ‘average’ season conditions out to 2022. The latest BOM three-month outlook indicates a higher chance of below average rainfall and hotter-than-average temperatures for WA, western SA and the majority of eastern and south-eastern Australia for the February to April period. This outlook follows an extremely challenging 2018 and provides little prospect of relief to widespread rainfall deficiencies across Australia before late autumn (at the earliest), particularly drought-stricken NSW and parts of south-west Queensland. The report also assumes that current exchange rates versus the US$ will remain for the projection period, but warns that any major swings in currency value could have a significant influence. MLA’s market intelligence manager, Scott Tolmie, said drought conditions that had swept across NSW and parts of Queensland had undone much of the herd rebuild achieved since the 2013 -2015 drought. As a result of elevated slaughter and substantially lower than usual branding rates, particularly across the largest beef producing states of Queensland and NSW, the national herd is expected to decrease a further 3.8pc by mid-2019, Mr Tolmie said. A significant turnaround in conditions would be needed before rebuilding could recommence. “The prospect of another below average northern wet season and a largely negative three-month rainfall outlook will likely mean many producers that retained stock in 2018 will continue or commence destocking in the months ahead,” he said. Carcase weights are expected to drop to an average 289kg/head this year as the female kill remains elevated and the ability and cost to finish cattle remains challenging. Mr Tolmie said any further destocking would see downward pressure on cattle prices this year, particularly for store-conditioned cattle. “Finished cattle will likely remain supported to some degree, given the tight supply of quality slaughter cattle and strong demand fundamentals in many markets,” he said. Seasonal conditions would most likely have the strongest impact on domestic cattle prices, however exchange rates, rates of production and export in the United States and South America, market access developments and demand from China would all play an important part. Carcase weights are expected to drop below 290kg/head as the female kill remains elevated and the ability and cost to finish cattle remains challenging. Many factors are set to assist export prices in 2019, such as a low Australian dollar and the largely positive shifts in demand for Australian beef in key markets. However, increased supplies from the US and Brazil will see competition ramp-up, while the unfolding US-China trade war may act as an economic handbrake in two of Australia’s major beef markets and have wider implications for the global economy, threatening to dampen any significant upside potential. Overall, the development of seasonal conditions in Australia will likely override these global forces in the near-term. If there is a major improvement in seasonal conditions across eastern Australia, supplies will tighten sharply and fierce restocker competition may re-emerge, as was the case in 2016. The elevated level of female slaughter in 2018 means breeder cattle, in particular, will remain in short supply and high demand if conditions improve. Many producers will be eager to hold onto breeders they still have to avoid the expensive exercise of restocking when conditions turnaround. Yes we put the last 900 Santa G ertrudis cows left on Bull Creek on the market last week for $750 hd. with calves given in. Over 5o mm so far tonight and raining. Cows are off the market !